Since their introduction, drones have been used for many different applications. For example, they have been used for surveillance, delivery, and have even been used for urgent health care purposes. In fact, in simulated emergency situations, drones were able to carry defibrillators to heart attack victims faster than an ambulance (by 16 minutes). If bystanders are willing and able to use the devices, the shorter response time can make a huge difference and even save lives. A clinic based in Southwest Virginia has been eyeing the use of drones as a way to deliver medication to uninsured residents in remote areas of Appalachia. Two years ago, the first drone approved by the Federal Aviation Administration (FAA) to deliver medication took flight. However, FAA restrictions have since prevented the clinic from using the drone for deliveries. Women in Ghana have limited access to contraceptives, so the United Nations commissioned 5-foot drones to air drop condoms over rural parts of Ghana. 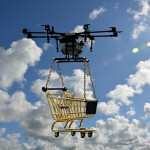 Other countries are considering adopting the use of drones to ensure quick and efficient deliveries. Despite the fact that one in ten people in Malawi is HIV-positive, the nation has only eight labs that can test for the disease. They have relied on motorcycle drivers to deliver blood samples from rural villages for testing, however, the use of drones can help labs turn around results faster. Drones could potentially deliver telemedicine kits, including Google Glass, to get doctors in touch with victims of natural disasters or terrorist attacks. Google Glass would enable a bystander to be walked through treating someone in need of emergency care. Again, FAA approval would be necessary for the use of this. As early as last fall, Zipline used commercial drones to deliver medical supplies from its distribution center in Muhanga, Rwanda. Remote clinics are able to order supplies via text and receive an air drop delivery in as quickly as 15 minutes. Share your thoughts on drones and their role in the health care industry with us on Facebook, Google+, Twitter, LinkedIn, and Pinterest. Find a great selection of security cameras and equipment at SecurityCamExpert.com. Contact us at 888-203-6294 to learn more about our products and installation services, or to schedule a free* site survey. Drones can be helpful in many different situations since they can monitor and even deliver tangible items to areas with limited access. In farming especially, drone imagery can provide a close, more in-depth look at crops, without spending excessive time on the fields. In fact, farmers have been using drones for years now. Because farms are often located in remote areas where powerful computers and networks are few and far between, the shift from centralized computing to edge computing is gaining traction. Aside from agriculture, edge computing is coming into play in many other industries as well. In general, this entails light processing on the periphery of the network, or the edge, as close to the originating source as possible. The end result is faster speeds with less strain on the core network. With this advanced technology comes more precise, data-driven agriculture. Drones are a much faster, cost-effective way of combing through the field than obtaining images from satellites or planes. These days, drones can be launched and controlled with an app and come equipped to guide itself through the field and take detailed pictures in various lighting environments. Specialized software can then analyze all the data collected to pinpoint problems (ex. dead plants, poor drainage), allowing farmers to address these issues in a prompt manner. For example, in conjunction with Fieldscanner (the latest product from software vendor DroneDeploy), farmers are able to view their crops in real-time, while the drone is still flying. Via a wireless link, computing takes place on board the drone and on the user’s Apple device. Previously with DroneDeploy, an expensive drone-based modem and LTE connection was necessary to send photos to the cloud for instant analysis. Now with Fieldscanner, the images are sent to an Apple device in real-time. The need for internet connection is unnecessary thanks to the processing power of both the drone and the mobile device. Aside from being able to address issues promptly, immediate feedback allows farmers to quickly move on if the area appears fine. This saves network capacity since a more detailed reading is unnecessary. 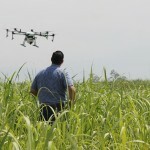 In addition, farmers can upload the data to the computer or a cloud service and produce detailed 3D imagery. While this drone software is still in beta testing, it is indicative of where the future of drones and farming is headed. What are your thoughts on farming with drones? Share with us on Facebook, Google+, Twitter, LinkedIn, and Pinterest. Visit SecurityCamExpert.com to browse our inventory of top quality security cameras and CCTV surveillance systems or call us at 888-203-6294 today! We have seen a rise in the interest and use of drones in the consumer market, but the use of drones for businesses has been limited thus far. Some drones have been designed to work on oil rigs and telecommunication towers, while others have been used on construction sites, but we have yet to see more widespread use. This limited use is not because of lack of technology or accessibility, rather the privacy and security issues that arise with the use of drones. “Rise of the Drones,” a recent report from the global technology association ISACA, delves into the potential uses of drones in a commercial environment along with critical elements which must be considered before implementing drone programs. Members were also polled in regards to the use and planning for drones within their industries. 75% say security or privacy are the biggest concern about the business use of drones. 65% say most organizations that would benefit from the use of drones are unprepared to address the necessary security and privacy requirements. 63% do not believe their current staff has sufficient expertise to evaluate the security of drones. Only 25% believe the benefits of drones outweigh the security and privacy risks, but an additional 48% say this will happen eventually, when concerns are addressed more thoroughly. According to these results, it seems we need more education and awareness in regards to drone use and security. Implementing drone programs prematurely can cost the business lots of money and hassles. While there is potential for drone use within enterprises, it appears most organizations are simply not ready yet. Share your thoughts on drones for business use with us on Facebook, Google+, Twitter, LinkedIn, and Pinterest! For our selection of security camera systems, parts, and accessories, visit us online at SecurityCamExpert.com. For questions about our packages, services, and more, please call 888-203-6294. From law enforcement surveillance to recreational use by consumers, drones have grown in popularity over the years. Because of their advanced capabilities, a company has even created a drone home security system. Proposed by Sunflower Labs, the system is designed to complement an existing alarm or security system. The drone streams video to your smartphone when a potential danger is detected, allowing you to determine whether you need to take further action or not. The system is comprised of a drone plus in-ground smart lights used to detect motion, vibration, and sound. Using advanced data analytics, the system can differentiate humans from cars and animals. When there is a disturbance, artificial intelligence determines whether it is dangerous or not. For example, mail delivery persons will be recognized by their behavior (typically a quick stop by the front door or mailbox). On the other hand, suppose a person approaches the back door and lingers. A push notification will be sent and you will be asked if you would like to look into the situation. Assuming you say yes, the drone will lift from its perch and autonomously fly to where the suspicious person is located. The drone will hover (30ft) until it is told to return to its nest. There is also an option within the app to alert local police. By sending the drone to investigate first, Sunflower Labs CEO Alex Pachikov believes that this will decrease the number of false alarms. The drone also allows you to monitor your entire property instead of just entrances and exits, like most other security systems. The drone is designed to be a minimal nuisance. Currently, the propellers automatically shut off if they hit anything, and considering its size, it is relatively quiet. The ultimate goal is decrease noises to a quiet hum and to get its weight down to half a pound (its current weight is two pounds) before it ships. In addition, it features two cameras which only capture footage of the home owner’s property in order to protect neighbors’ privacy. Still, there are safety, privacy, and nuisance concerns about the drone. Since August, new rules allow operators who have passed an aeronautical exam to fly commercial drones under 55 pounds no higher than 400ft. And autonomous flying is not allowed for commercial drones. Despite this, Sunflower Labs has no worries. They believe the policies will not apply as the homeowner will use the drone for non-business purposes. Since recreational users face fewer restrictions, homeowners will likely be held in the same regard. As this system continues to develop, more details will emerge. As for now, the lights are expected to cost $159 each, and the drone may be rented for a fee (comparable to the cost of traditional alarm systems). Would you consider utilizing this drone security system for your home? Share your thoughts with us on Facebook, Google+, Twitter, LinkedIn, and Pinterest! For traditional security cameras and equipment, please visit SecurityCamExpert.com. If you have any questions or need assistance, please call us at 1-888-203-6294. During the holiday season, the big guns come out and innovative tech gadgets hit the market. It’s always fun to see what’s offered during this time. It seems this year the buzz surrounds new wearable tech, smart devices, and commercial drones. TGI Fridays decided to take this technology a step further and use drones to spread some holiday cheer within their restaurant. The Fridays Mobile Mistletoe is a mistletoe carrying drone which travels around the restaurant and hovers over unsuspecting couples. Per mistletoe tradition, the pair is supposed to kiss. The drone then captures the magic moment on its camera. A pilot program was originally launched at the TGI Fridays Manchester Royal Exchange restaurant in the United Kingdom. 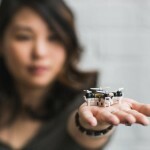 The positive response inspired locations in New York Westbury and Brooklyn to introduce these holiday drones into their restaurants. The concept of a mistletoe drone is festive and smart, but the execution could potentially cause problems. As the Brooklyn location rolled out the Mobile Mistletoe, it is reported that a person suffered a minor injury from the drone. This may cause legal concern for both the establishment as well as concerns about personal safety among diners. In addition to injury risk, questions arise about the Federal Aviation Administration (FAA) regulations on commercial drones. However, since these drones are being used indoors as opposed to outdoors, jurisdiction becomes cloudy. What do you think about the Fridays Mobile Mistletoe drone? If your local Fridays restaurant had them, would they entice or discourage you from dining there? Share your thoughts with us. Connect with us on Facebook, Google+, Twitter, and Pinterest. Let SecurityCamExpert.com deliver quality security camera systems to you. Shop our selection online or order over the phone at 1-888-203-6294. We all know how innovative apps can be these days, but did you ever think your phone could immediately help you in an emergency? Not only does the LifeLine Response app allow your phone to become a panic button, but at the release of your thumb from the button, police are notified and dispatched while a drone speeds to your rescue. Once the app is installed on your phone, you can open it when you feel concerned about your safety. The press of a button connects you to controllers, and you can express your concern. As soon as pressure is released from the button, law enforcement and a drone will be sent to your GPS location. The drone travels 60 mph and can stay with you until authorities arrive, or it can follow the suspect, all the while recording the incident. Besides its recording abilities and speed, the drone is meant to scare off a potential attacker to provide safety for the individual. Cahill ensures that efforts have been made so that their drones comply with the Federal Aviation Administration (FAA) regulations. The drones would be stored at appropriate law enforcement headquarters, enabling quick response to potential crime scenes. It has been reported that about 30 college, corporate, and hospital campuses have elected to be of the first to use this technology, though names have not been disclosed. While this endeavor seems promising, do you think the masses will accept this type of emergency system? As drones gain in popularity and their applications expand, do you believe this app, in particular, will shine a good light on drone use? Join our discussion on Facebook, Google+, Twitter, and Pinterest! Find great quality, excellent prices, and unmatched customer service when you shop with SecurityCamExpert.com. Browse our stock of superior security cameras, security camera systems, surveillance equipment, and more online. If you have any questions, please feel free to contact us directly at 1-888-203-6294.